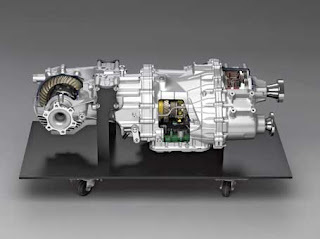 The GR6 transmission on the 2007 Nissan GT-R was the first all wheel drive transaxle in a front engine production car when it was released in Japan. It has had some teething issues. The first teething issues were related to the undocumented LC1, launch control feature. Violent wheel hop was associated with the 4500 rpm launch, and clutch engagement. I had some ideas about that back in 2008, and some of those things are used in the current LC4 for the 2012 up cars. 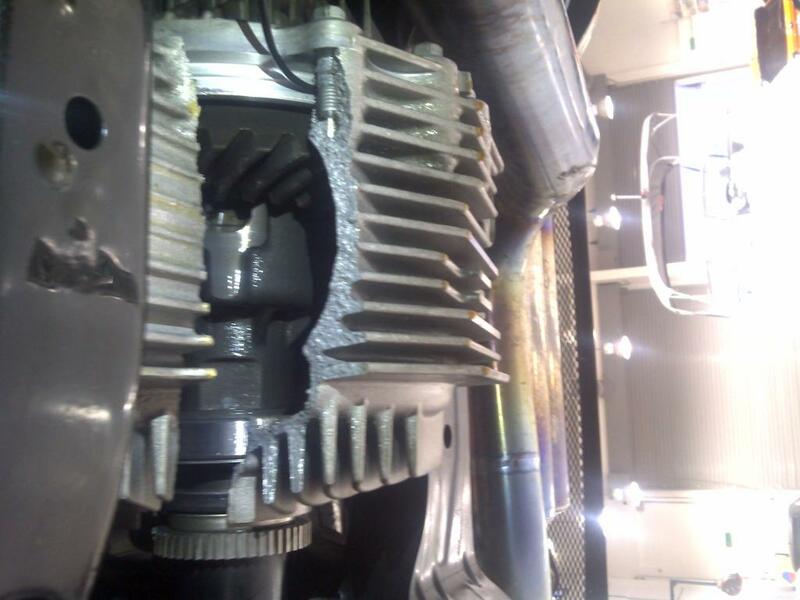 We are now starting to see a few broken rear differential sections on the GR6. Here is a video of one 9 second Nissan GT-R from the Middle East that snapped a rear differential on a pass. The results of this video, and this hard launch. You can see that the cast aluminum case looks like it has failed. The issue with the GR6 transaxle is that it is long. Perhaps it is wrapping up weirdly, bending and flexing during the hard launches. Most differentials in cars are in an iron case. The iron flexes a lot less than aluminum. In the past, I have had some issues breaking front aluminum differential cases/oil pans on Skyline GT-R's, but those were normally because the spider on the front diff spit a part out of the case. 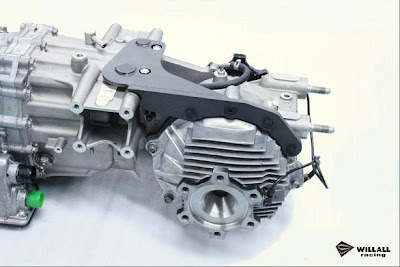 Willall from Australia has made up a transmission brace to help support the case. It looks like its a good start, but I think high horsepower cars that get violent wheel hop will still be able to snap the rear differential. As you can see in this picture, the rear mounting studs for the differential/rear part of the transmission seem to be a starting point for the fractures. It seems like the transmission is wrapping up here and cracking. The brace should help prevent some of this wrapup. 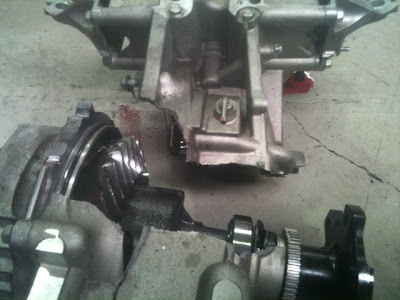 There have been a few rear differential breaks recently, and there have been several that have not been talked about on the forums. One other continuing issue with the GR6 is the lack of service parts. In this case, it should be possible to just replace the differential, but from Nissan the GR6 still an entire assembly. That assembly includes the clutch, the transfer case, the transmission control, the rear differential, and the transmission gears themselves. There are now aftermarket replacement parts, and several shops that are able to work on the transaxles, but it still remains a daunting item for most Nissan GT-R owners. One other spoken of issue related to the rear differential is temperature. From statements from Mizuno, and Nismo, the rear differential contributes greatly to the overall temperature of the transmission. A few companies have worked on coolers for the rear differential, but its not a very common item to see. Out at the Targa New Zealand, Steve Millen's Nissan GT-R had a rear differential failure of an undetermined nature so far, but there were metal shavings in the oil. It seems like a rear differential, and transmission cooler are important for a car that is road raced. I am working on a guide to the various cooling options, plus some track recommendations for a Nissan GT-R. Check back to the site to see some of the options soon. I think it's all to do with the weight of the car! 1700Kg has got to take it's tole on the car diff! Get the car down to 1550-1590KG And I think the problem will go away!